Hillary Clinton and Bernie Sanders are bringing their presidential campaigns to sunny California. Clinton, who won Arizona’s primary Tuesday night, arrives in the Bay Area on Wednesday for a couple of fundraisers. Later that evening, Clinton will hold another fundraiser at the Avalon nightclub in Hollywood, an event to be emceed by Russell Simmons with special performances by Ben Harper, Estelle and Mary J. Blige. But if you want to attend, you better have some cash on hand. The cheapest tickets still available will set you back $500 per person, according to an invite (there are also $1,000 tickets up for grabs). Sanders travels to Los Angeles for a last-minute event at The Wiltern theater on Wednesday evening. And true to a Sanders event, tickets are free, so that everyone — not just the top 1 percent — can attend. But you better get there early because the venue can only hold about 1,200-1,400 people, which for Sanders is like a small, intimate brunch with his besties. This will be Clinton’s eighth fundraising visit to Los Angeles since announcing her presidential bid. Clinton was in Southern California earlier this month for Nancy Reagan’s funeral in Simi Valley, but held no fundraisers. Sanders held an October fundraiser at the Avalon, where he was introduced by comedian Seth MacFarlane. 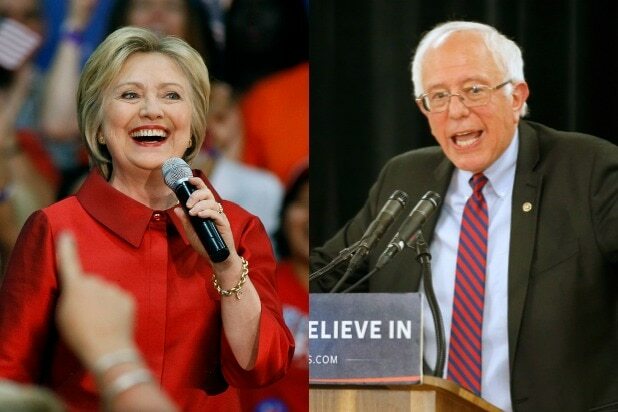 The Democratic candidates are gearing up for the California primary on June 7. With 475 delegates up for grabs, it’s the biggest prize of the entire race.